The Nowhere Man is a legendary figure spoken about only in whispers. It’s said that when he’s reached by the truly desperate and deserving, the Nowhere Man can and will do anything to protect and save them. But he’s not merely a legend. Evan Smoak is a man with skills, resources, and a personal mission to help those with nowhere else to turn. He’s also a man with a dangerous past. Chosen as a child, he was raised and trained as an Orphan, an off-the-books black box program designed to create the perfect deniable intelligence asset: An assassin. Evan was Orphan X—until he broke with the program and used everything he learned to disappear. But now someone is on his tail. Someone with similar skills and training who will exploit Evan’s secret new identity as the Nowhere Man to eliminate him. 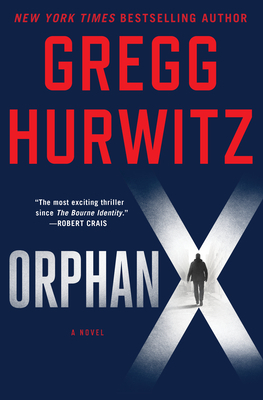 GREGG HURWITZ is the New York Times bestselling author of more than a dozen novels, including the #1 international bestseller Orphan X. His books have been shortlisted for numerous literary awards, graced top ten lists, and have been translated into twenty-eight languages. He is also a New York Times bestselling comic book writer, having penned stories for Marvel (Wolverine, The Punisher) and DC (Batman). Additionally, he’s written screenplays for many major studios and written, developed, and produced television for various networks. The Last Chance is the sequel to The Rains, Gregg's first YA novel. Hurwitz resides in Los Angeles with two Rhodesian ridgebacks.